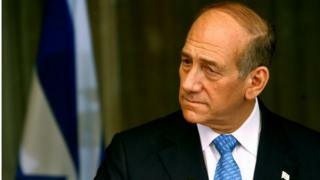 Former Israeli Prime Minister Ehud Olmert was plagued during his years in office, 2006-09, by a string of corruption scandals, which played a major part in his eventual resignation. The 70-year-old will now become the first former Israeli head of government to be sent to jail, after a bribery charge in one case was upheld by Israel's Supreme Court. Below is a summary of the main cases. In April 2010, law enforcement sources told the BBC Olmert had been named as "a prime suspect" in a multi-million dollar corruption scandal. City officials are alleged to have taken bribes during Olmert's term as mayor of Jerusalem, between 1993 and 2003 to speed up a controversial residential development, known as Holyland, in the heart of the city. In January 2012, he was one of 18 people charged with giving or receiving bribes in connection with the development. Olmert was convicted on two separate bribery charges in March 2014 and later sentenced to six years in prison. In December 2015 the Supreme Court acquitted him of the bribery conviction related to Holyland, but a separate conviction of illicitly taking a 60,000-shekel (£10,400; $15,500) payment for another project was upheld. The six-year prison sentence was reduced to 18 months. In September 2012, Olmert was given a one-year suspended jail sentence and a 75,300-shekel fine for breaching the public's trust in connection with his conduct as minister of trade and industry. This followed his conviction in July. During the trial, the prosecution argued that Olmert had knowingly placed himself in a situation where he faced an "acute conflict of interest" by dealing personally with issues involving business figures represented by lawyer Uri Messer, a friend and former business partner. These included projects handled by the Investment Center, a ministry-run body. Olmert held some meetings directly with Uri Messer and his clients, and changed some decisions made by the ministry in their favour, the charge sheet said. It listed four examples - one of which was the reversal of the lowering of a tariff on oil imports during a period when Mr Messer was representing a major Israeli producer of oil products. Mr Messer argued that his dealings with the industry ministry were "routine" and "businesslike". After hearing the verdict, Olmert told reporters: "I leave court today with my head held up high." He added that he would not appeal against the conviction. The suspended sentence is conditional on Olmert not committing the same crime in the next three years. Olmert was acquitted of fraud, breach of trust and concealing fraudulent earnings in 2012 in connection with donations received from a New York-based financier, Morris (or Moshe) Talansky. Mr Talansky had testified that he handed over cash to Olmert amounting to $150,000 to fund political campaigns between 1997 and 2005. He also hinted the former politician had a liking for fine hotels, cigars, pens and watches. Prosecutors said he had failed to declare the funds. They also claimed Olmert facilitated introductions - sometimes with official letterheads - with hotel managers for Mr Talansky, a partner in a firm providing mini-bars for hotels. Olmert admitted taking money, but said it was legal donations to fund his campaigns for re-election as mayor of Jerusalem and for the leadership of the Likud party. The acquittal was seen as a major victory for the former leader and sparked hopes of a political comeback. But his former aide Shula Zaken later became a state's witness and offered diary entries and tape recordings that implicated Olmert. A retrial was ordered and judges ruled he had given Zaken part of the money in return for her loyalty and used the rest for personal use without properly reporting it. He was convicted of fraud and breach of trust in March 2015 and later sentenced to eight months in jail. He is appealing against the conviction. Olmert was charged with concealing fraudulent earnings, fraud, breach of trust, fraudulent tax evasion and fraudulent registration of corporate documents in connection with claims that he over-billed the Israeli state and Jewish charities for trips abroad. The charge sheet said he and his aide Shula Zaken "developed a fraud system" using false documents, through which he gained $92,164. The sheet said this included asking each of a number of organisations to fund the same trip, and falsifying elements of itineraries. It said the state and the organisations "paid surplus funds for the purchase of air travel for the defendant, in a manner which left in his hands substantial financial surplus, that served him and his family to finance private flights and to upgrade his flights to first class". Organisations billed in this way included: Akim, a charity which helps disabled people; the Yad Vashem Holocaust memorial centre; and March of the Living, which takes Jewish teenagers to visit the Nazi death camp sites, prosecutors said during the trial. Olmert's lawyers said the attorney general's decision to back indictment in the case was "puzzling and unreasonable", and that some of the details and allegations were not raised when the former prime minister was questioned. Olmert was found not guilty of the charges in July 2012. In October 2007, Attorney General Menachem Mazuz ordered a police investigation into allegations that Olmert, when he held the jobs of trade minister, communications minister and finance minister, had improperly appointed associates from the Likud party to posts on government bodies. The investigation was completed in July 2009. Police concluded that there was a basis to indict Mr Olmert and others for fraud and breach of trust. An adviser to Olmert accused the police and prosecutors of "petty and inappropriate score-settling" and creating "media spin" when the announcement of their conclusions coincided with the closing of the Cremieux Street investigation (see below). In August 2012 the State Prosecutor's office said it would not pursue charges. In 2008, police said there were no grounds to lay charges against Olmert in connection with the privatisation of Bank Leumi - Israel's second largest bank - while he was finance minister in 2005. It had been alleged he tried to influence the sale of the state's controlling interest in the bank in favour of a friend. Israel's attorney general decided in August 2009 to close a criminal investigation by police into Olmert's purchase of a Jerusalem property in 2004, in which he paid $325,000 (£162,500) below market value. The investigation was closed due to lack of evidence. The prime minister has insisted the price was fair and the inquiry (into whether he had received a discount for speeding up a property development project) was "uncalled for". The case was known as the Cremieux Street affair after the address of the property.